This summer is still sizzling, so take advantage of the last weeks of the season with food, drinks and a table outside. When I think summer, I think great outdoor dining with a view, and John Wright Restaurant in Wrightsville offers just that. With views of the Susquehanna River and Wrightsville-Columbia Memorial Bridge, John Wright is the ideal place to enjoy an end-of-summer meal. "Families come here to have their stay-cation," John Wright executive chef Jim Switzenberg said. "Sitting outside in the beautiful weather, it's just awesome." The pizza patio, which offers fresh wood-fired pizza and the best seating in the restaurant, is only available until the end of September. In August, the patio is open from 3 to 9 p.m. Wednesday through Saturday. In September, find the patio open from 3 to 9 p.m. Fridays and Saturdays. Reservations are encouraged. Grabbing a Fat Boy from Crabbs Tropical Treat in Hanover is an essential way to cap off your summer, even if you have to wait in line. It's as traditional as Labor Day itself. Since Crabb’s opened in 1953, the drive-in has traditionally closed just before fall. This year, the restaurant will close its doors Sept. 24. “There’s customers that we see every week, and we’ll miss them,” said Shawn Myers, Crabbs' assistant manager. Monday-Thursday – noon to 10 p.m.
Friday-Saturday – noon to 11 p.m.
Monday-Thursday – 5 to 10 p.m.
Friday – 5 to 11 p.m.
Saturday – noon to 11 p.m. The mixture of Cherry Lane's cityscape and umbrella of trees can be an inviting escape from the sad desk you’re probably sitting at while reading this. Cherry Lane is located in the ideal spot to grab grub in the city. On Central Market days, take your pick of the the variety of options available to you. On non-market days, check out Baron von Schwein, York City Pretzel or one of the many food hot spots within a block or two of the park. For an added bonus, the annual concert series, Box Lunch Revue, is still taking place on market days. The series has gone on all summer and featured a menagerie of musical talents. The series will end for the year Aug. 30. One of the best parts of summer is grabbing that great ear of corn off the stalk or taking that juicy tomato right off the vine. Whether it’s in your own backyard or at stands throughout the county, appreciate the quality of produce the area is getting this time of year. The summer harvest is just coming into its prime, and several farmers noted that a great crop is expected at your local stand. Can’t find one of the many roadside stands throughout the county? 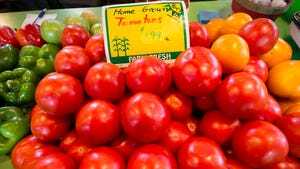 Check out the big markets — like Brown's Orchards in Loganville or Flinchbaugh's Orchard & Farm Market in York, or even your local supermarket, many of which have fresh, local produce this time of year. Anthony J. Machcinski is the Food and Drink reporter for FlipSidePA and the York Daily Record. Follow him on Facebook and Twitter, or email him at amachcinski@ydr.com.